Most modern bicycles use derailer (or dérailleur, if you prefer the French spelling) gearing systems. Gear shifting is accomplished by leading the chain from one sprocket to another. Derailers look complicated, but they are actually very simple, brute-force devices. The front derailer simply consists of a cage made of sheet metal that can move back and forth from side to side. As it does, it pushes the chain sideways until it can't run on the chainwheel it has been riding on, then the chain falls off and lands on the chainwheel closest to its new location. The rear derailer looks more complicated, but the only additional complication is that the rear derailer also contains the arm with the spring-loaded pulleys, that takes up the slack as the chain goes to smaller sprockets. Both derailers work by pushing the chain sideways, so that it runs at an angle onto the sprocket, instead of straight. When the angle becomes sharp enough, the chain can no longer mesh with the sprocket. It then falls off of the sprocket and lands on the next one in line. When the chain is being shifted from a smaller sprocket to a larger one, it is slightly different. The chain is forced to rub against the side of the larger sprocket next to the one it is riding on. Eventually, it gets snagged on the sides of the teeth of the larger sprocket, and yanked up and away. Newer sprockets usually have specially shaped teeth, and ramps on their sides to make this operation run more smoothly. This is the major reason that modern derailer gear systems work better than older ones. It has very little to do with the quality of the derailer. Before You Try To Adjust A Rear Derailer, Make Sure It Isn't Bent! When a rear derailer gets whacked, it bends inward, toward the spokes. In some cases, it will actually go into the spokes of the rear wheel while it is turning. This is very bad news when it happens. If you are lucky, the derailer breaks. If you are less lucky, it takes a few spokes with it, and can easily ruin your rear wheel. If you are truly unfortunate, the pull of the spokes on the derailer can tug it backwards so forcefully that the dropout (the frame part that the rear axle and derailer attach to) will be bent very sharply backward, or even broken. In some cases, this can render a frame a total loss. You can roughly check alignment by eye, if you look at the derailer from the rear. The two pulleys should be lined up exactly underneath one another, so that the chain runs straight up from the tension pulley to the jockey pulley, with no sideways slant. Compare the line of the pulleys with that of the sprockets above them. Well-intentioned folks sometimes grab ahold of the derailer and try to pull it back outward to its proper position. Unfortunately, they usually wind up yanking on the derailer by its pulley cage, which is the weakest part. As a result, they fail to straighten the bent hanger, and, instead, bend the cage as well. When a derailer hanger is bent, it is generally necessary to remove the derailer to straighten it. Bike shops have a special tool, a bar with a sliding gauge on it, that screws into the hole in the hanger in place of the derailer. This tool provides lots of leverage to straighten the hanger with, and has a gauge to judge when it is parallel to the rear wheel. A rough, on-road repair is sometimes possible by removing the derailer and bending the tab with an adjustable wrench. Note, wide-range Campagnolo derailers have cages that are not intended to be vertical; the lower pulley is farther outboard than the jockey pulley. The limit stops are two screws that set the limits of how far the derailer can move from left to right. They are usually located on the back of the parallelogram; sometimes they face outward to the bicycle's right. The ends of a screw bumps into an internal part of the parallelogram when the derailer has moved all the way in the direction controlled by that screw. The limit screws are not intended to move the derailer; they tell it where to stop when it is moved by the shifter control. Loosening a limit stop allows the derailer to be moved farther in a particular direction by the shifter. Tightening it restricts the motion of the derailer in that direction. Normally, the limit stops need to be set when a new derailer is installed, and should not require any further attention. If they seem to need adjustment on a bicycle that used to work properly, it is usually an indication that the derailer is bent. Trying to correct a bent derailer with the adjusting screws is OK as a temporary field repair, but is not a correct long-term repair. On newer derailers, the limit stop screws are labeled: "H" (high) and "L" (low). On some older derailers, there is no such label, because the working ends of the screws are visible. If you shift such a derailer into high gear, note which screw is bumping into an internal part of the derailer...that screw is the high-gear stop; the other is the low-gear stop. These are not particularly fussy adjustments. Don't be afraid to give half a turn or a turn at a time. The only place where there's any danger is the rear derailer's low gear stop, which can allow the derailer or the chain to go into the spokes if it is set very loose. The other limit stop screw of the rear derailer (and the two on the front derailer) will cause overshifting if set too loose, but this is relatively harmless and easily corrected. The low gear limit stop (usually marked by the letter "L") stops the derailer from shifting past the largest sprocket and throwing the chain into the spokes. If it is too loose, the derailer can overshift into the spokes, with disastrous results. If it is too tight, it will be difficult or impossible to shift down to the largest rear sprocket. 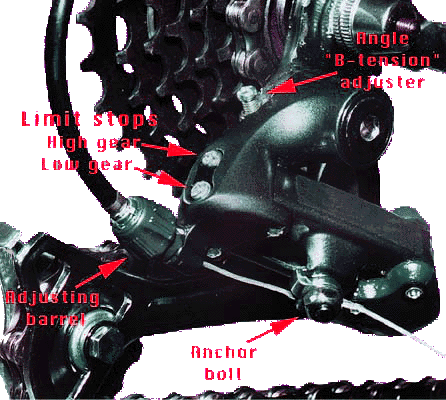 The high gear limit stop (usually marked by the letter "H") stops the derailer from shifting past the smallest sprocket and wedging the chain between the smallest sprocket and the dropout. If it is too loose, it really doesn't make much difference on a bike with indexed shifting, because the cable will not let the derailer overshift past the smallest sprocket. If the screw is too tight, it will be difficult or impossible to shift up to the smallest rear sprocket. Difficulty in upshifting to the smallest rear sprocket is rarely caused by misadjustment of the high-gear limit screw. More often, it results from the derailer's being bent, or from excess friction in the cable. If a derailer is correctly adjusted when it is installed, this is the only adjustment that should have to be tweaked later on, to accommodate cable stretch, or when cables are replaced. The indexing adjustment is an adjusting barrel located at one end of a length of cable housing. Many rear derailers have more than one index adjuster. All indexed derailers have an adjuster where the final loop of cable housing ends at the derailer itself. Many bicycles also have another adjusting barrel located so that it can be adjusted while you are riding. On mountain-bike-type shifters, this will be located at the shifter itself, just where the cable exits. On road bikes with handlebar-mounted shifters, there will usually be an adjusting barrel at the cable stop where the upper length of housing ends on the upper end of the down tube. It doesn't matter which of these adjustments you use: use whichever is more convenient. Before you try adjusting the indexing, shift to the highest gear (smallest sprocket.) Make sure that the shifter is in the position that allows the cable to be as loose as it can get. (Exception:	Shimano	Rapid Rise derailers work the opposite way, so you are shifting to the largest sprocket). Click the shifter to the first click after the fully loose position, then turn the pedals forward. The chain should shift to the second smallest sprocket. If it doesn't, it means the cable is too loose. Turn an adjusting barrel counter-clockwise to tighten the cable. Start with half a turn, then check again. It is very common for beginners to over-correct by turning the adjuster too far. Sometimes this will result in moving the indexing so far off that it sort-of works, except that the clicks are one notch off, so one of the extreme gears doesn't work properly, but the others appear to be OK. This is why it is important to check that the shift from the smallest to the second-smallest sprocket occurs in the right place on the shifter. turn the barrel counterclockwise to tighten it. turn the barrel clockwise to loosen it. If the rear indexing works properly when using the large chainwheel but not on the small chainwheel, or vice-versa, this is often a sign that the rear derailer hanger is bent. Modern derailers have two spring-loaded pivots. The lower pivot, sometimes called the "a pivot" winds the cage up to take up slack as you go to smaller sprockets. The upper "b pivot" adds additional slack take-up ability by pushing the derailer's parallelogram backwards. Most derailers have an angle adjustment screw (Shimano calls it "B-tension adjustment"). This adjusts the tension of the upper ("b") spring of the parallelogram, and thus the height of the jockey pulley. The looser this screw is, the closer the jockey pulley will be to the cluster. If the angle adjuster is set too loose, the jockey pulley will bump into the largest sprocket when the bicycle is in the lowest gear (large rear, small front). This is the gear you should check the adjustment in. A larger low-gear sprocket may require a different rear derailer, for enough angle adjustment to clear the sprocket. In extreme cases, such as with a Shimano 36-tooth sprocket, a longer angle-adjustment screw may be needed -- some people even install the screw backwards. Since a derailer shift is caused by forcing the chain to run at an angle, the greater the angle, the sooner it will shift. The closer the jockey pulley is to the cluster, the sharper the angle will be for a given amount of sideways motion of the derailer. Thus, the looser the angle adjuster screw is, the better the shifting will be. 2001 and later Campagnolo rear derailers don't use a "b tension" adjustment. Instead, they have an "a tension" adjustment. Spring balancing is done with this adjustment, but in the opposite direction. That is, loosening the "a tension" has the same effect as tightening the "b tension." If you replace your chain or sprockets, you should check your chain length. New chains come longer than they need to be for the vast majority of bicycles. You will almost certainly need to shorten a new chain before installing it on your bicycle. If your large sprocket sizes are anywhere near the maximum your rear derailer can handle, the chain length can be quite critical. If the chain is too short, it will be at risk for jamming and possibly ruining the rear derailer if you accidentally shift into the large-large combination. Never run with a chain that is too short, except in an emergency. If the chain is too long, it will hang slack in the small-small combinations. You should never use those combinations anyway, so this is not a serious problem. If you exceed the recommended gear range for a particular rear derailer, you may have to accept droop in these gears. You may need to add links on recumbent bicycle, or a touring bicycle with a large cluster. Only combine new chains of the same brand and model. You could ask the bike shop for surplus links from another chain. These probably would only have been discarded anyway. The best technique for setting chain length is to thread the chain onto the large/large combination, without running it through the rear derailer. Mesh the two ends on to the large chainwheel so that one complete link (one inch, -- one inner and one outer half-link) overlaps. In almost all cases, this will give the optimum length. run through the rear derailer. Overlaps by a half link. by a full link as at left. Start with the shortest chain that would permit connection, allowing one extra complete link as shown in the photo at the left above, so the bottom of the chain droops if you align it as in the picture at the right. Then, with the rear derailer in the outermost position, thread the chain through the rear derailer and connect it. Turning the crank by hand, check that the chain will shift to the large-large combination using the front derailer or rear derailer, or both at once, without binding. Note: SRAM 1X systems require two extra complete links. See the SRAM manual. To shorten or lengthen a chain, you need to use a chain tool to press out a link pin. Not all chain tools work with all chains, so make sure you have the right one. When possible, work by shortening the chain, rather than lengthening it. Making the chain too short, then lengthening it is a time-waster. Preferably, join the chain using a master link, so the chain can easily be removed for cleaning. The narrowest chains, used with cassettes that have 10 sprockets -- sometimes 9 -- must be joined using special one-time-use replacement pins or master links. You probably only get one of these with a new chain, so it is important to get the length right on the first try. Chain condition will have an effect on how well your system shifts; in particular, if you chain is dry and rusty, it will not shift well, because the links will be stiff. Chains wear out, typically after only a few thousand miles. As they wear, they elongate slightly. They should be checked regularly for signs of this sort of wear. This issue is addressed in detail in my article on Chain Wear and Maintenance. A worn chain will usually not be the cause of shifting problems, but usually is the cause of skipping under load. The easiest way to fix this is to bend the problem area of the chain into a "Z" shape, with the bad joint on the diagonal part, then flex the chain back and forth from side to side. This will slightly spread the tight plates, and free up the link. A link that has been bent in a chain-jamming incident can cause similar symptoms. Generally, the bent link (or the whole chain) will need to be replaced. But see our article about on-road repairs: the chain can sometimes be unbent, good enough to get home or to the next bike shop.. There are different front derailers for different seat-tube angles, different-sized chainwheels, two or three chainwheels, and in some cases, different shifters. See my article on front derailers for details. The front derailer should not be adjusted unless the rear derailer is already working properly, because front derailer adjustments are affected by the position of the rear derailer, and you will need to access all of the rear sprockets to adjust the front derailer correctly. Front derailer adjustment is not an exact science. It requires a good eye and a bit of patience to get right. When you apply power to the pedals, the power is transmitted to the rear sprockets by the upper run of the chain. The lower run of the chain is just the return path, and the only tension on the lower run is applied by the spring in the rear derailer. Since the front derailer does its shifting with the upper, power-transmitting, section of chain, it has a harder task. In general, you should not expect a front derailer to shift well while you are pedaling hard, even if the rear derailer does. On a bicycle with a small rear wheel, high bottom bracket or steep seat tube, the chain cage of the front derailer needs to sit farther to the rear. Instructions for many clamp-on front derailers specify a range of angles. The front derailer of some bicycles attaches to a special slotted tab, which may be brazed, bolted or glued onto the frame. The tab limits the range of chainwheel sizes that can be used, but it can be aligned ideally for the particular bicycle. Another solution is a Shimano E-type front derailer, which attaches to the bottom bracket, so it can be rotated to any needed angle --though it can be used only with the particular chainwheel sizes for which it is designed. The most critical adjustment of a front derailer is its attachment to the bicycle frame. This must be set correctly before you attempt to adjust the limit stops. All derailers except the E-type derailer allow two adjustments, for angle (as seen from above) and height. of the front derailer is judged by looking down on the cage from above. Modern front derailers have very subtly shaped cages, so it is not always easy to tell when the ideal adjustment has been made. In general, the centerline of the cage should be parallel to the centerline of the frame. Rotating the derailer so that the back of the cage is farther out will sometimes improve shifting to the small ring of a triple by preventing overshifting, but may cause increased need for trimming on the larger rings. It may also cause the crank to strike the cage. Rotating the derailer so that the back of the cage is farther in will help reduce the need for trimming on the large chainwheel, and will provide crisper downshifting, but with a greater tendency to overshift on the inside. This may be appropriate on bicycles equipped with an anti-derailment device. of the front derailer is a principal factor in how well it will shift. Manufacturers commonly recommend 2 mm clearance between the bottom of the outer cage plate and the teeth of the large chainwheel. This is a bit of an oversimplification. Best performance will result from the very lowest position that still just barely keeps the cage from hitting the chainwheel teeth. The lower you can get it, the better it will shift, and the less you will need to trim the front derailer. To get the front derailer as low as possible, the curvature of the outer cage plate has to match the curvature of the largest chainwheel. If you use a larger chainring than the derailer was designed for, the rear of the cage will hit the teeth of the big chainring before the front of the cage gets low enough to provide crisp shifting without the need for trimming. If you use a smaller chainring than the derailer was designed for, it will shift OK, but you'll have to do a fair amount of trimming, due to the rear of the cage being higher than it should be, so that the chain crosses through it farther back. Lately I've started modifying front derailers for improved shifting with larger rings. I have a Shimano RSX front derailer on a bike with 50/38/28 Biopace (the sweep of a 50 Biopace is comparable to that of a 52 round.) The RSX front derailer works great on its intended 46/36/26 setup, but the cage doesn't match the curve of the larger chainring. In a couple of minutes with a grinding wheel, I removed a good bit of metal from the bottom rear of the outer cage plate, and a bit from the bridge section where the inner and outer cage plates connect at the back. This made the derailer match the curvature of the larger chainwheel, and allowed me to set it low enough to provide good chain control. This setup now works fine with an STI indexed shifter that doesn't permit "trimming" the front derailer. The low-gear limit stop stops the derailer from shifting past the smallest chainwheel and throwing the chain onto the bottom bracket shell. If the stop is too loose, the chain will fall off when you try to downshift to the small chainwheel. If too tight, you will find it difficult or impossible to shift down to the small chainwheel. On older front derailers, the low-gear stop is the one closer to the frame. Many newer designs reverse this position for reasons relating to the mechanism used. The basic adjustment for the low-gear stop is to set it so that the chain just barely clears the inner plate of the cage when the lowest gear (small front, large rear) is selected. This will usually be the best position for double-chainwheel setups, and will permit the use of most or all of the rear sprockets with a minimum of trimming. For triple chainwheels, it will sometimes be necessary to adjust the low-gear stop a bit looser, so that the outer plate of the derailer can travel far enough to knock the chain off of the middle ring. In some instances, you may find that one adjustment of the low-gear stop causes the chain to derail past the small chainring, but a tighter setting results in slow downshifting to the small ring. In such cases, a good, if inelegant, solution is sometimes to install an anti-derailment device that clamps to the seat tube. These products, such as the 3rd Eye Chain Watcher ® and the N-Gear Jump Stop ® set up a barrier preventing the chain from overshooting the small ring, no matter how loose the low-gear stop is set. This allows the low-gear stop to be set to allow the derailer to move farther inboard for faster, more precise shifting, even under some load. These devices can often save the day when extra-wide range gearing is used on a mountain bike or tandem. The high-gear limit stop is pretty straightforward. It should be set so that the chain almost rubs on the outside plate of the front derailer cage when the bicycle is in its highest gear (large front/small rear). This will reduce the need for trimming as you shift the rear derailer. If the shift to the large chainwheel is slow, make sure that you aren't pedaling too hard: front upshifting requires being ready to have the cranks slow down when the shift takes place. If the shift is unreliable even when you are pedaling lightly, you may be able to improve it by loosening the high-gear stop a bit. If you do so, check to make sure that the derailer cage is not moving so far out that it can be struck by the crank as it goes by. Sometimes front upshifting may be improved by rebending the front edge of the inner cage plate outward a bit. This may be done with an adjustable wrench. This is rarely necessary on modern front derailers, but used to be a very common trick on older, cruder designs. As you shift the rear derailer one way or another, the direction from which the chain runs from back to front changes a bit. As a result, sometimes it is necessary to "trim" the adjustment of the front shifter after changing gears with the rear, even if you are staying on the same front chainring. Trimming means using the shifter to move the front derailer cage sideways just a little bit, enough to stop the chain from rubbing, but not enough to make it shift to a different chainring. Older front derailers designed for friction shifters used to require trimming as a matter of course, but newer indexed systems can often be set up so that no trimming is necessary. For a "trimless" front indexing, you will usually need to be using the particular chainwheel sizes for which the front derailer was designed, and the chainwheels must not be bent even a little bit. The lower down the cage is mounted, the less trimming will be needed. If your system requires trimming, it is essential that you do it. If you ride with the chain rubbing against the front derailer cage, you will wear a groove in the side of the cage and it will never shift properly. "Chainline" refers to the sideways distance of the chain/sprockets from the centerline of the bike. Front shifting problems are frequently related to incorrect chainline, that is, the chainrings are either too close in, or, more commonly, too far away from the bike's centerline. This generally is the result of having the wrong bottom bracket for the particular crankset model in use. More often than not, shifting problems are due not to any problem with the derailers, but to excessive friction in the cables that control them. The usual effect of cable friction is to make the derailer move sluggishly when the return spring is pulling it toward a smaller sprocket. The most common area for this problem is the short loop of cable housing that leads from the rear stay to the derailer. The front end of this housing is exposed to road spray from the front tire, and the resulting rust can seriously degrade shifting. This cable loop should be fairly long, so that it makes a very gradual curve. Many bikes have too short a housing loop here. Another problem area is the cable guide where the cables run under the bottom bracket. In addition to sluggish upshifting, friction in this area can cause spontaneous upshifting under load. Instead of the spiral-wound wire used in brake-cable housing, the "compressionless"cable housing for indexed shift applications uses multiple straight wires sandwiched between plastic, and requires a fairly special tool to cut properly. When you buy such housing, you would do well to have exact length information so that the shop that sells it to you can cut it for you, if you don't have a suitable cable cutter. When you cut housing, the plastic liner gets squished a bit. It is helpful to clean and round out the opening with an awl or scriber. The final loop at the rear derailer is short and has a nearly 180 degree bend. "Compressionless" housing is normally used for this. I've taken to bending the piece of housing to the approximate shape it will be used in before cutting it. If you cut the housing straight, all of the longitudinal wires come out the same length, so when you bend it, the end of the housing acquires a slanted face, since the wires on the inside of the bend have a longer way to go around the curve. It is my belief that cutting the housing while it is bent makes a smoother, more reliable connection at the end of the housing. You must have a ferrule at each end of each piece of housing. This helps keep the hole in the housing aligned with the cable stop, and also keeps the housing from falling apart. With modern, lined housing, greasing the cables is no longer necessary. In fact, it makes things worse, due to the stickiness of the grease. A bit of medium oil on the section of cable that runs through the rear loop to the rear derailer will help retard rust, though. Cables and housing come in a wide range of quality. I recommend buying only premium-grade cable and housing. For problem installations, super-premium cables such as Gore Tex ® will help. There are also some situations where the spring tension of the rear derailer is just insufficient to overcome the cable friction. 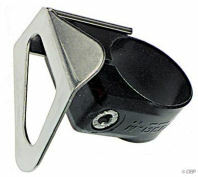 SRAM (Grip Shift ®) used to make a product called a "Bassworm ®" which seals the rear housing loop and supplies spring assistance to the cable at this point. A Problem Solvers Travel Agent, using only the larger pulley, can substitute for 90 degrees of cable bend, and reduce friction. I have another major article on cables at this site, covering these issues in more detail. To replace a derailer cable, you want to start out with both the derailer and the shifter in whichever position has the cable slack. This will usually be the position corresponding to the smallest chainring/rear sprocket. If you disconnect the cable (or if it broke) and pedal the bike a couple of times, the derailer will automatically go to the correct position. While operating the shifter to get it to shift to the loosest position, you may need to pull on the cable . If the shifter indexes, it will stay in that position. If it is a friction shifter with a return spring, you may have to tighten the friction adjustment to get the shifter to stay in the loosest position. Once the derailer is disconnected from the derailer's anchor bolt, pull the housing (if any) away from the shifter, and then push the exposed inner cable into the shifter. The moulded end of the inner cable should then pop out of the shifter. If it's a simple lever shifter, such as a down-tube or bar-end shifter, the cable end is readily visible. If it's a more complicated ratcheting type shifter, there will usually be an access hole where the cable end can pop out...but this access hole may line up correctly only if you remembered to shift to the loosest gear position first. In case a Shimano STI shifter does not release to this position, please see advice on another page. Hole for cable insertion is visible after releasing the shifter to the loosest position and squeezing the brake lever. Cable insertion into STI brake-shift lever. Arrow indicates forward motion of cover plate when brake lever is squeezed. Twist-grip shifters such as SRAM GripShift are typically the most difficult for cable changing, and these commonly require disassembly. Generally, the derailer limit stops should not require any adjustment when you replace a cable, but you will need to adjust the indexing. Before connecting the cable, screw the adjusting barrel all the way in, then back it out maybe a turn or a turn and a half. This will give you the opportunity to loosen the cable a little or to tighten it a little or a lot. Thread the cable through the shifter and any housing. Check the condition of the housing and particularly the open ends. Replace or trim if needed. See also my Cables Article. Pull on the cable and operate the shifter until you have the slackest position. The chain will normally be on the smallest chainring. Run the cable under the anchor bolt hardware and secure it. If it's an indexing system, and particularly with triple chainrings, you will need to fine-tune the indexing to get it to shift well and run smoothly on the middle chainring. Thread the cable through the shifter and any housing. Check the condition of the housing and particularly the open ends. Replace or trim if needed. See also my Cables Article. Pull on the cable and operate the shifter until you have the slackest position. The chain will normally be on the smallest rear sprocket. Use a pair of pliers to pull the cable really tight and secure the anchor bolt. Use the adjusting barrel to correct the indexing adjustment. Hand pedal forward with your right hand while manually pushing the rear derailer inward until the chain engages the 3rd smallest sprocket. Stop pedaling, then let go of the derailer. The derailer spring will try to move the derailer outward toward the smallest sprocket, but the stopped chain won't let it go all the way. Pull fairly firmly on the end of the cable to take up the slack and secure it with the anchor bolt. Then you can pedal and check the indexing adjustment. I find that this usually gets me quite close, with only a minimal amount of fine tuning needed to the indexing adjustment. One area that commonly causes problems is the attachment of the inner cable end to the derailer's anchor bolt. If this comes in at the wrong angle, it can change the geometry of the parallelogram and make it impossible to get the derailer to index properly across its range. There is usually a groove in the derailer body or a washer with a bent corner to determine that the cable is running correctly. Alternate cable routings for Shimano derailers adapt them for use with nonstandard shifters or cassettes. There is detailed information about mixing and matching derailers, shifters and cassettes in our article about drivetrain mixing. Some newer front derailers are designed with a choice of two cable attachment options. If the cable is run on the outside of the anchor bolt, away from the parallelogram pivots, the cage moves less far for a given cable movement, providing a lighter action, and easier fine trimming. If the cable is run on the inside of the anchor bolt, toward the parallelogram pivots, the cage moves farther for a given cable movement. This is often necessary to provide correct functioning with indexed shifters. Do your pedals sometimes jump forward when you pedal extra hard? This is a common complaint, especially when a rider stands up to pedal. Indeed, this dangerous condition is one very good reason for remaining in the saddle and spinning in your lower gears, rather than standing up and pumping in a higher gear. Although jumping/skipping/autoshifting is often blamed on the derailer, it is only very rarely the result of a derailer malfunction. This jumping may be one of two totally unrelated problems: skipping or autoshifting. The first step in troubleshooting this problem is to determine whether the problem is simple skipping or autoshifting. Skipping involves the chain jumping over the tops of the sprocket teeth under load. After the chain jumps, it remains on the same sprocket. This is usually caused by wear to the chain and/or the sprockets, and is most likely to happen on the smaller rear sprockets, especially if they are used in conjunction with the small chainwheel in front. This issue is addressed in considerable detail in my article on Chain Wear. A form of skipping, not necessarily under load, sometimes also results from stiff links. Autoshifting feels just like skipping, except that after the jump you find that the rear derailer has shifted up to the next smaller sprocket. Autoshifting is commonly caused by a combination of frame flex and cable friction. The mechanism of this is explained in detail in a separate article on Autoshifting. As you can see, there is a lot to be done to get the most out of your derailers. Buying a more expensive derailer is usually not the solution to shifting problems. The actual performance of your system will depend much more on how well the system is set up and adjusted. There has been more improvement in front derailers than in rears. If you have an older front derailer, and it is not giving satisfactory performance, you may benefit from a replacement. Beware, however, because older front derailers were designed to work with a wide range of chainwheel sizes, while new models are optimized for particular ratios, and may not work well with your crankset. Thanks to Andrew M. Torres for his kind assistance. Would you like to read what I wrote about derailers twenty years ago? BicycleTutor.com has a video that covers some of this material. See also the Park Tool Website.